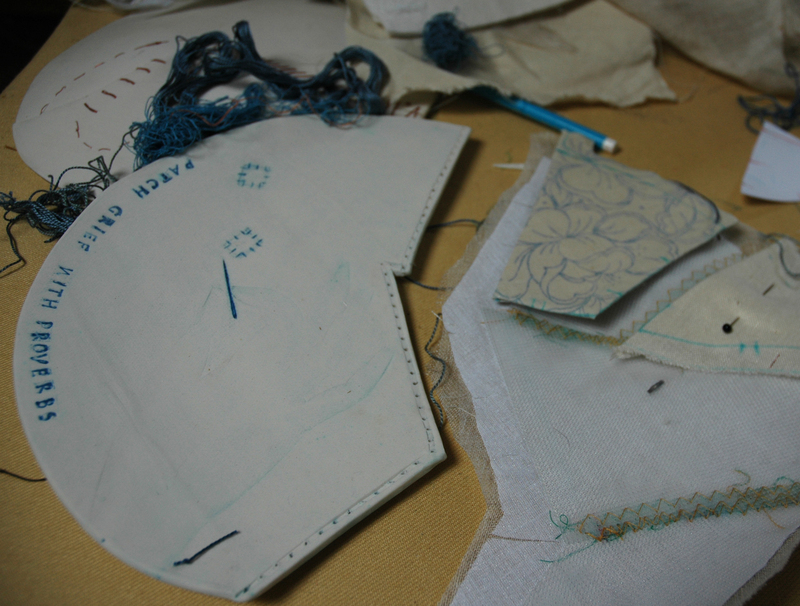 I have eventually found the time to get back to the Stitched Ceramics story. Hanne Rysgaard and I found a few odd days to work together during the past months to develop samples of the plates I want to make. 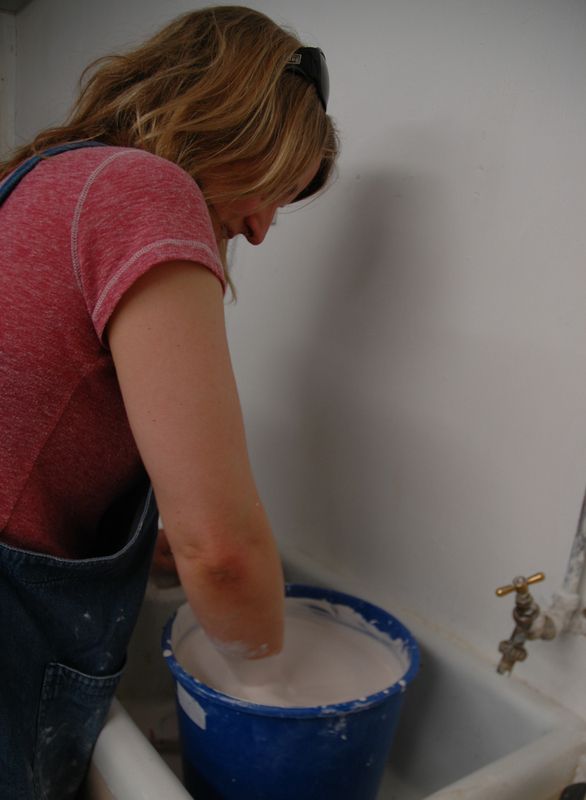 The first thing we did was make some new molds, well actually Hanne made new molds while I took the pictures……. 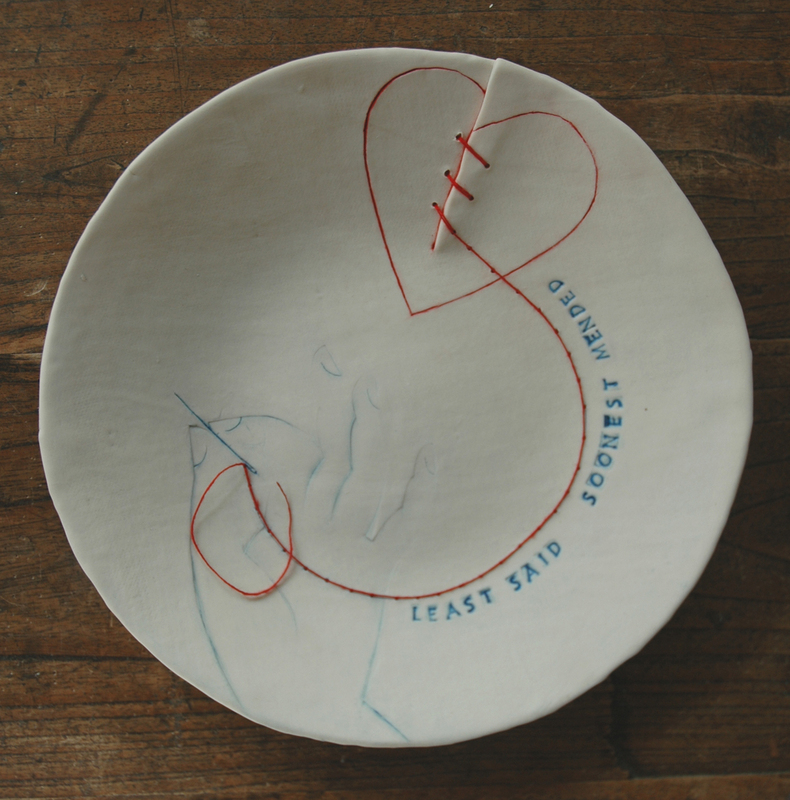 Meanwhile I got on with drawing out designs for different plates, I had really liked the poem by W.H.Auden and the broken heart image (see the Category Archive, Stitched Ceramics May 18th) I wanted to repeat this design but with a motto instead of the poem or find a poem I could use without having to deal with the copyright restrictions…but Hanne had recommended not writing a great deal as the porcelain would probably dry out too much for me to be able to manipulate the clay into the tears and holes for later mending. 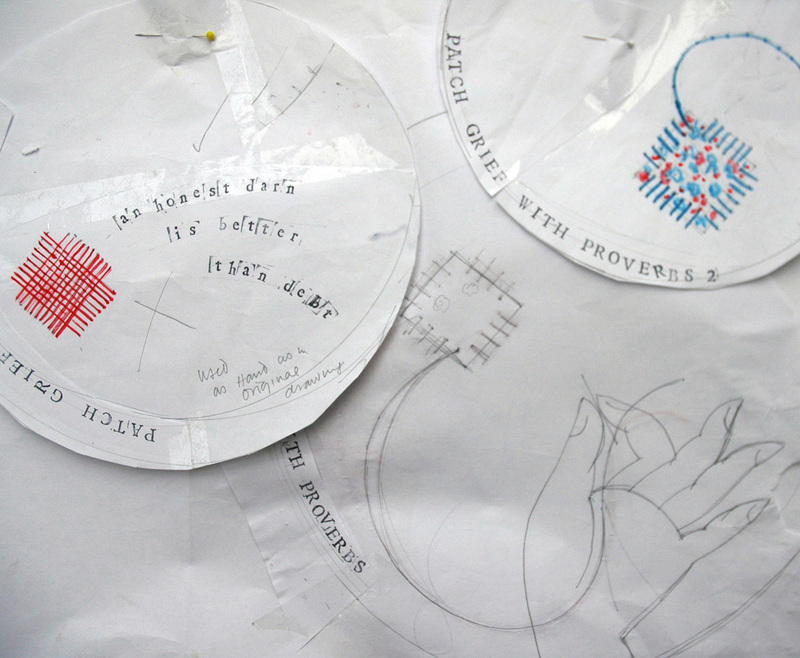 I made several drawings at this stage and some of these initial ideas did survive intact to the finished sample stage – others have been rather rearranged and one has been mended – for real. 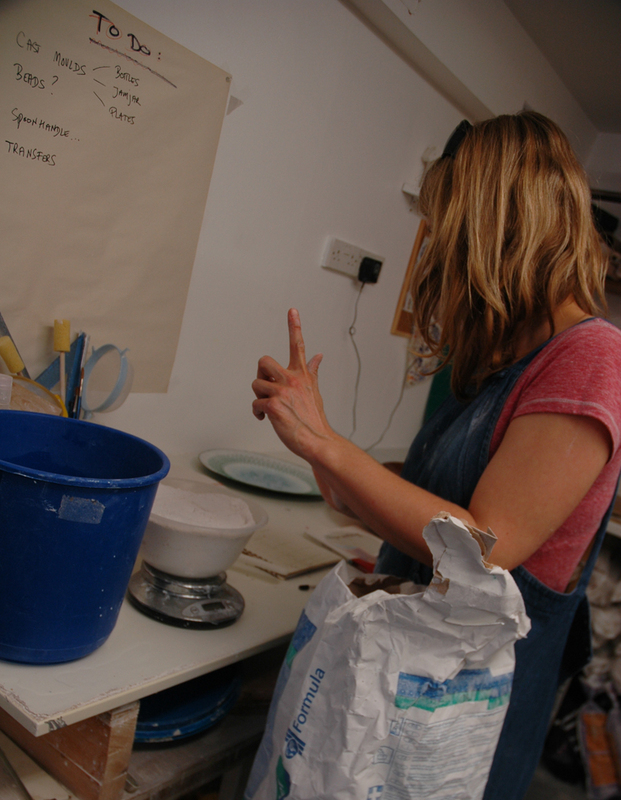 Hanne rolling out the porcelain on her new bit of kit. 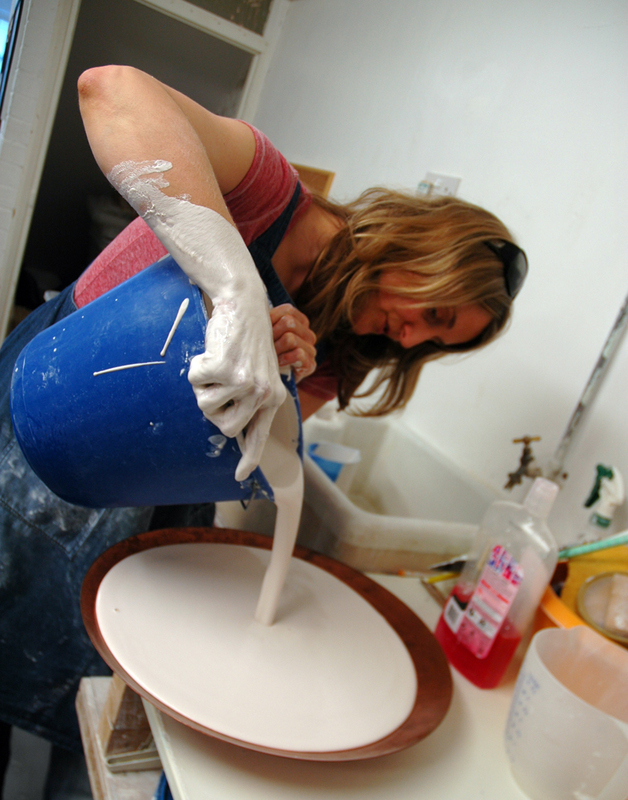 When I returned to the ceramics studio, Hanne rolled out the porcelain for me, gave me the molds she had prepared earlier and went upstairs to look after Blaze gallery. I had drawn and cut some stitching hands from card for impressing onto the clay and I also used the copper blanks I had previously plasma cut for enamelling, these proved to be the best at making the right amount of depth for the impressions. 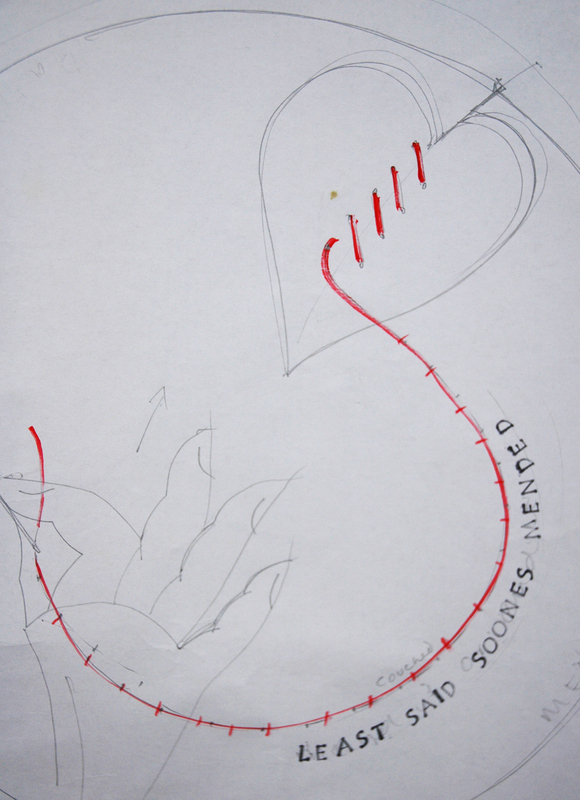 Using the working drawings, which were pretty basic, see above, I started to work. 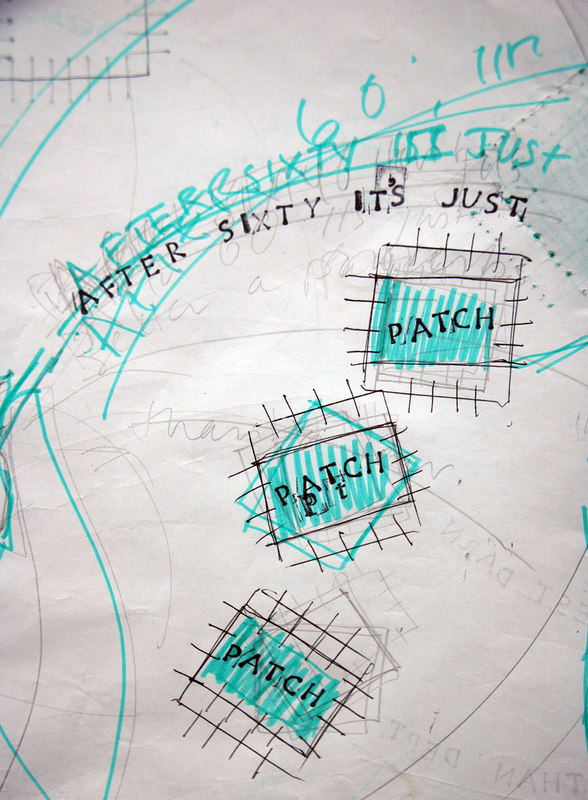 Nerve wracking stuff – as the slightest mark is not easily erased, so I was forced to be more controlled learning to rely on my instincts – if you make a wrong move you will have to redress it either now or later when it is fired – or discard it – I was NOT about to discard anything I had been given to work with and which had been so lovingly prepared for me; time to get a grip. 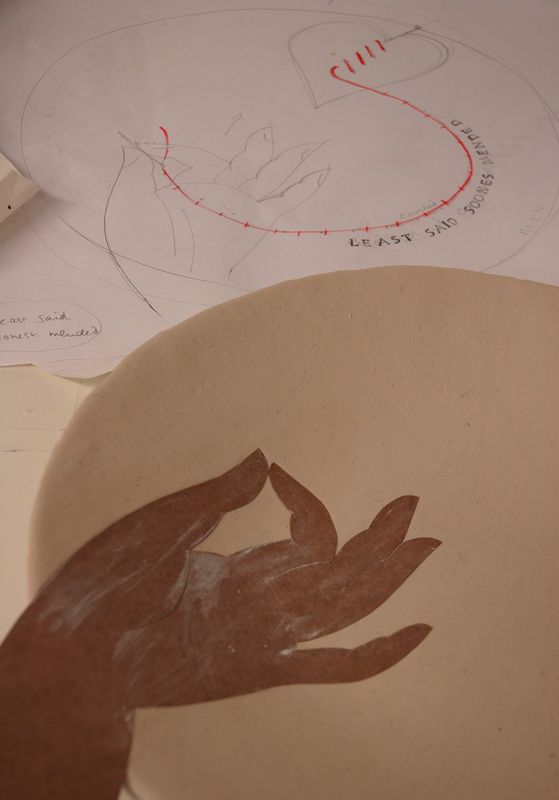 I started out quite well, the first hand impress although a bit weak, was simple and effective, the finished dish looks more or less as I imagined it would – see below no blocked stitching holes, no cracks, no loss of shape – I should be thankful for beginners’ luck! 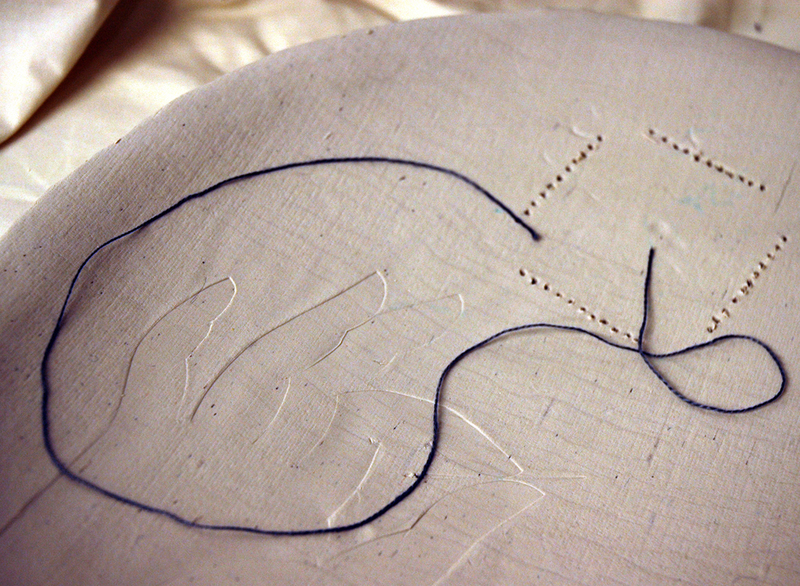 And the rest of the day went well, I made 2 more dishes, well one and a half…I had not enough clay for a whole third plate so started to get inventive….I thought that a half a plate with the holes pierced for stitching another material to it would be interesting…I used a crazy patchwork technique for this. 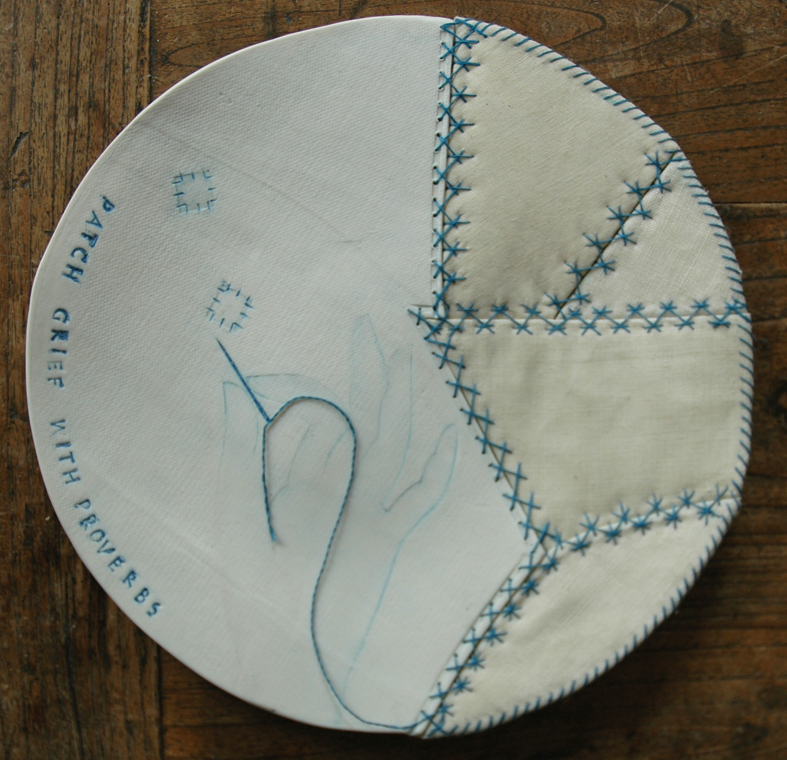 This half dish had lost its shape in the kiln, so I had nothing to lose by experimenting with it and although I feel this version is not working due to the pull of the linen fabrics over the curve of the dish, which may be eradicated by cutting them on a different grain, I feel that there is a lot potential here; Liz Hewitt, another embroiderer, told me about a kind of felt that can be molded when wet and will dry to shape – and it can be stitched ….so I will try this idea again – maybe – if I get the time. 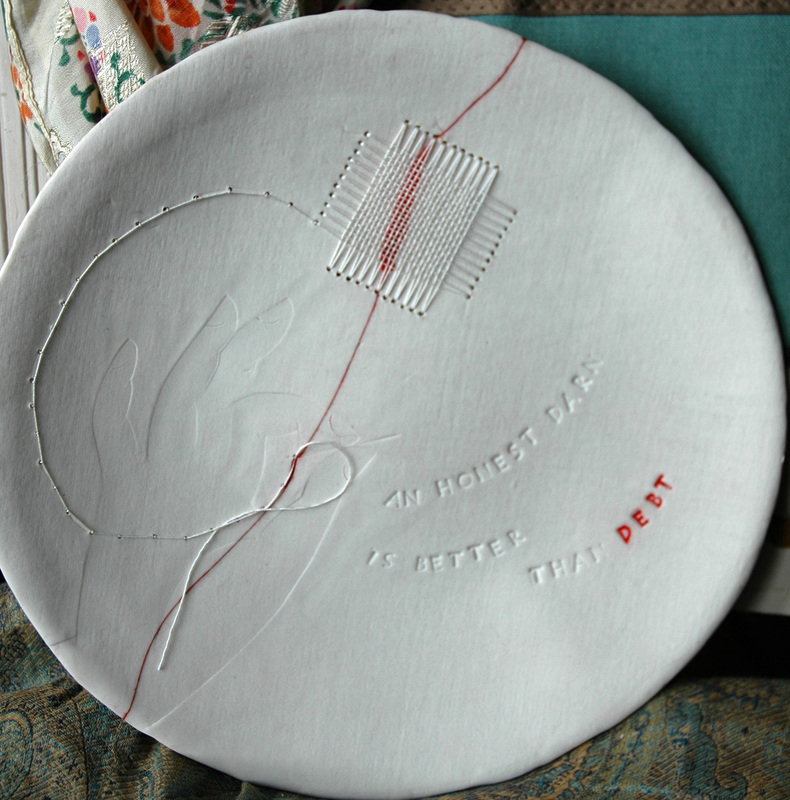 But the dish that was to test me most was just simple and pure white with a motto and stitching hand, it needed no further colour, just taking home and darning. 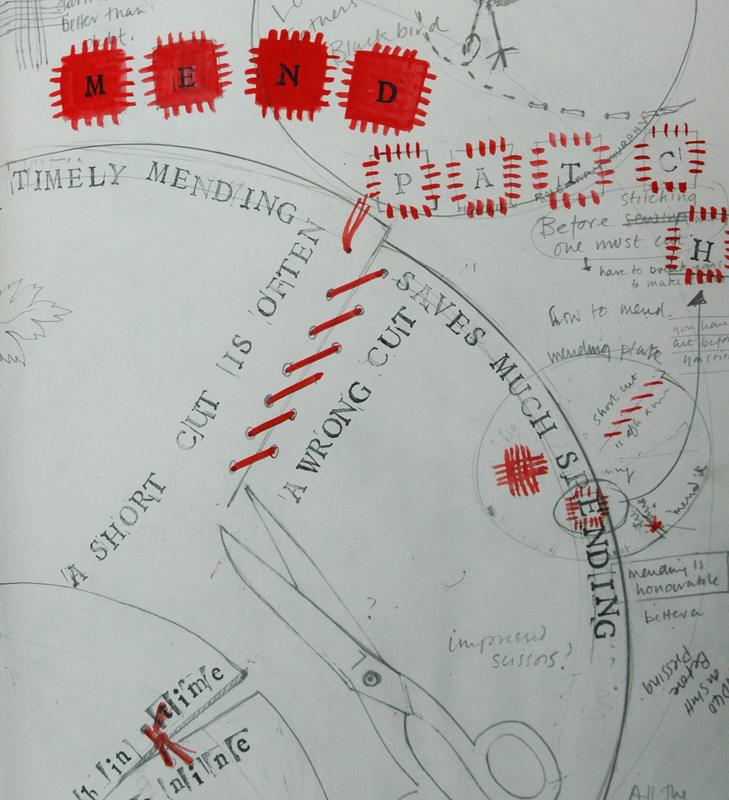 There was one small problem, several of the holes I had pierced had fused together; I set about filing them out…. I was oh so careful, when one push too far through the actual needle eye and KERACK..the whole plate split in two, right through the hand but, thankyou universe, the darning patch as well. You know when you just feel sick, sorry and stupid! 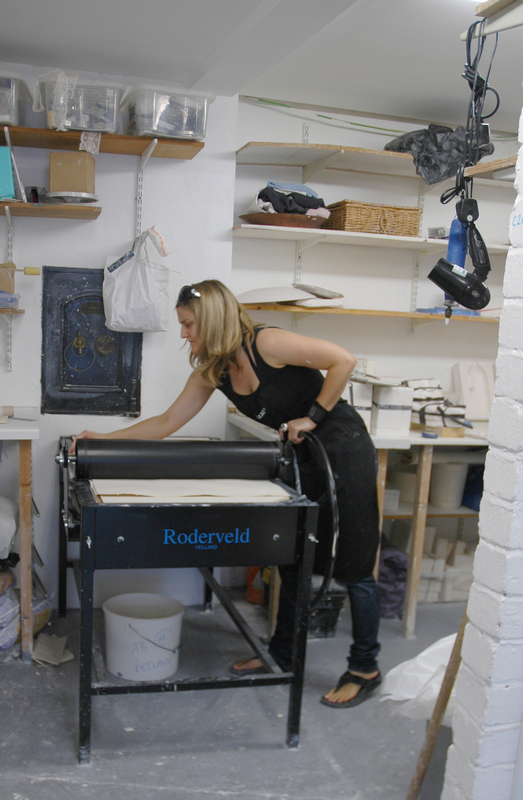 I wanted to weep, but just had to carry on – Araldite, fast drying Araldite came to my aid. And YES I do appreciate the irony of this…..but I still had to hold the 2 pieces together in my hands for more than 30 minutes and imagine trying to do this when your are telling yourself to just chuck the whole lot away and forget you ever had any ambitions and isn’t this what you always do – mess up because you want too much control…and you desperately need to pee. Anyway when it finally felt safe to loosen my grip after walking round my studio a dozen times, I tightly bound it in some strips of fabric and left it overnight – unusually I took no photographs of this episode – too sick about it all. But I am leaving you with another motto which just makes me laugh ruefully each time I turn it up in my research book, this needs a very special dish making for it….